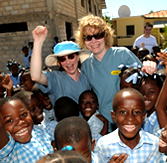 "In January 2007 I visited a small island off the coast of Haiti called Lagonave. The level of poverty I witnessed there moved me to get involved in assisting in the regeneration of the entire island. Whilst on Lagonave it became apparent that there was almost no access to the basics needed for life. Less than 20% of the population had ANY access to clean drinking water, one 35 bed hospital served the 100,000+ population and children all over the island were living as street children"
Lemon Aid are very excited to announce a new partnership with Music 4 Mission which allows you to download the best in new Christian music and support us at the same time!